Preliminary results were initially shared at January 2019’s Breakfast With The Mayors. “This issue of housing rose to the top when asked to identify the top three opportunities for improvement in Franklin today, but the focus was less on affordable housing for low-income individuals, but more fully reflecting on the need for attainable housing options for people in various stages of life and at various income levels,” Tate added. Third was the theme of growth and development, with a strong desire to see the city’s small-town charm maintained while recognizing that growth will, and should, continue. 42% of respondents had lived in their current home for less than five years, with more than half (53%) living in their current residence for 10 years or less. 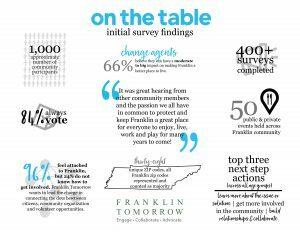 In 2019, Franklin Tomorrow is making plans on how to continue the conversations which started with On the Table and the community is invited to participate in those activities as they occur, whether they were a participant in the original On the Table conversations. Specific programs to reconvene conversations begun through On the Table, utilizing other civic engagement platforms, as well as through a second On the Table event in Fall 2019. Follow the link below to see the presentation to the City of Franklin Board of Mayor and Aldermen or view the video from the Jan. 22, 2019 meeting through this link.